It is many years since I was last in the former Hanseatic trading port of King’s Lynn. At that time, the present Minster was known simply as the Parish Church of St Margaret. In 2011, it was rededicated as King’s Lynn Minster in recognition of its role in the wider promulgation of the Gospel in West Norfolk. The church was founded in 1101 by the first Bishop of Norwich, Herbert de Losinga. The building has been subject to much ‘restoration’ over the past 900 years, with a complete rebuild after the spire collapsed in 1741 and more recently by George Gilbert Scott in 1874. There are few remains of the original Norman church. Finally, visitors to King’s Lynn must not miss the only surviving Hanseatic League warehouse in England. The specification of the instrument provided in the liner notes is an organ enthusiasts dream. It begins with details of the present organ and then reviews the previous builds and rebuilds. It is a nineteen-page essay! I will précis this essay in a paragraph or two. The original instrument was built by John Snetzler (1710-85) in 1754, at a cost of £700. The organ case was designed by John’s brother, Leonard. Since that time, it has had several rebuilds, most notably by Holdich (1848) then by Hill and Son (1870). However, as the liner notes suggest, it would be wrong to call the present organ a ‘Snetzler.’ It is in fact a Wordsworth of Leeds instrument with 12 ranks of the original organ incorporated. It was commissioned in 1895. Further work was carried out by Rushworth and Dreaper (1962), Holmes & Smith (2001/3) and Nicolson. (2014). The current instrument has three manuals, Great, Choir, Swell and Pedals. There are 59 speaking stops as well as a Cymbelstern (tinkling bells!). The liner notes helpfully detail the original source of each pipe from each rebuild. The specification published in the National Organ Register varies slightly from the liner notes. The objective in the selection of music for this CD was to ‘showcase the diversity of the instrument’s resources.’ This original ‘Snetzler’ pipes feature in the eighteenth-century repertoire, whilst the acoustic value of subsequent stop additions are explored in the remaining, largely 20th century repertoire. The recital opens with Percy Whitlock’s Hymn Prelude on ‘King’s Lynn’ which was published in 1945. It is based on Vaughan Williams eponymous hymn tune, which was a folksong collected in Norfolk, arranged for the English Hymnal and used for G.K. Chesterton’s ‘O God of earth and altar/Bow down and hear our cry.’ Whitlock’s treatment is varied, with a reflective opening, building to a huge, tuba-supported climax. John Jordan’s ‘Folk Tune’ is a pastoral stroll that reflects the Norfolk landscape. It is just a little bit too short. J.S. Bach’s massive Choral Partita "Sei gegrüßet Jesu gütig" BWV 768 is based on a hymn-tune setting the words ‘Hail to thee, kind Jesus.’ The progress of the music begins with a four-part harmonisation of the original melody. This is subject to ten variations with a concluding ‘monolithic’ five-part chorale. These variations are a commentary on the sentiment of the hymn, as well as an exploration of the musical content of the tune. It is surely one of Bach’s master pieces. It is especially effective on this organ. John Stanley’s Voluntary in D minor, op.5 no.8 is one of his best works. It is in the form of an Italian concerto which he may have been encouraged by Handel to adopt. It is rare (for Stanley) to have three movements: he normally employs a slow introduction followed by a fugue or an allegro. Massey presents a thoughtful account of this work, with a magical opening allegro, and a restrained ‘adagio’ followed by an exuberant fugal-tinged finale. Other 18th century pieces include the ‘expressive’ and ‘exquisitely decorative’ Récit de Tierce en Taille (from Livre d'Orgue) by the French baroque organist Nicolas de Grigny. It was originally used to accompany the Gloria during the Roman Catholic Tridentine Mass. Charles Burney’s Cornet Piece begins with a lovely ‘introduction for diapasons (the foundation stops on church pipe organs) and is followed by a fairly restrained movement for trumpet stop. The mood changes completely with Gaston Litaize’s vibrant ‘Epiphanie’ which was composed in 1984. The imagery behind the work is the arrival of the Magi at Christ’s Nativity. The music is full of joy, excitement and a sense of wonder, which complements the biblical story presented in St Matthew’s Gospel. I was delighted that Francesca Massey included Peter Racine Fricker’s ‘Pastorale’ in her recital. For anyone looking for a ‘cow and gate’ piece they need to search again. What Fricker has achieved is a reworking of the old idea historically associated with ‘shepherds abiding in the fields.’ The reed stop plays a wayward shepherd’s pipe tune whilst the accompaniment provides the drones of mediaeval instruments. Whether his Pastorale has biblical inspiration, or the secular Theocritus and his Idylls, it is really does not matter. This is an easily approachable piece that is typically reflective and less dissonant than some of Fricker’s contemporary pieces. To many folk, Max Reger conjures up an image of a severe German writing pedantic music that is dismal. It is imagined that all his music is excessively long, uncompromisingly chromatic and downright boring. The truth is that Reger’s style was wide-ranging and encompassed romanticism, neo-classicism, impressionism and a ‘back to Bach’ enthusiasm for the baroque. Exemplars include Wagner and Brahms, Richard Strauss and obviously Bach. Francesca Massey is currently Sub-Organist at Durham Cathedral, a post she was appointed to in 2011. Her duties involve playing for the daily diet of worship and training of the choristers. She has performed with the choir on several tours, broadcasts, concerts and recordings. Massey is currently Assistant Conductor of the Durham Singers, teaches organ and plays piano and continuo accompaniments for recitals. Other appointments have included organ scholarships at St George’s Chapel, Windsor Castle, Gonville and Caius College, Cambridge and Manchester Cathedral. She was the onetime Assistant Organist at Great St Mary’s Church, Cambridge and Assistant Director of Music at Peterborough Cathedral. In 2015 Francesca Massey issued her debut solo album, Bravura on the Priory label (PRCD1137). This included music by York Bowen, William Mathias, Olivier Messiaen and Oskar Lindberg. I had the pleasure in reviewing it for MusicWeb International. I do have one or two niggles about the programme notes. For example, the composers’ dates are not given, either in the liner notes or on the track-listings. Now I know that they are easy to look up on the Internet, or more mundanely in a musical reference book (I still use them!). But I feel it is important to have this information immediately to hand. I could not find a total playing time for the disc. Finally, yellow print on a green background (track-listing) is not good for people with less than perfect eyesight. What is not in doubt, is the detail presented by Francesca Massey in the programme notes and the above-mentioned essay on the organ. The text is a wee bit small, so it would be great if Priory had a .pdf file available on line: I may have missed some details as I read these pages. I enjoyed the sound quality of this disc and it passed the test of ‘like being in the church’. 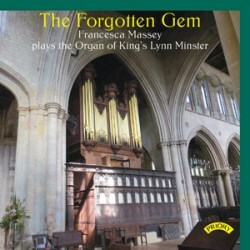 Francesca Massey has provided a varied and interesting programme that showcases the features of this splendid and historically important organ.